Update 1:18 p.m.: Scott says the pre-landfall disaster declaration will, "provide important resources and assistance from the federal government, as well as free up funding sources for emergency protective measures." It would impact 35 Florida counties – Escambia, Santa Rosa, Okaloosa, Walton, Holmes, Washington, Bay, Jackson, Calhoun, Gulf, Gadsden, Liberty, Franklin, Leon, Wakulla, Jefferson, Madison, Taylor, Columbia, Hamilton, Suwanee, Lafayette, Dixie, Gilchrist, Levy, Citrus, Pasco, Hernando, Pinellas, Hillsborough, Manatee, Alachua, Union, Bradford and Baker Counties. Scott has also extended his state of emergency order to include Bradford, Pasco, Hernando, Pinellas, Hillsborough, Manatee, Alachua, Union, and Baker Counties. With these additions, the state of emergency includes 35 Florida counties in total. Update 10/9/18 1:06 p.m.: The Gadsden County Board of County Commissioners has issued a mandatory evacuation for all mobile homes in the Midway, Quincy, Havana, Greensboro, Gretna and Chattahoochee city limits and unincorporated areas of the county. 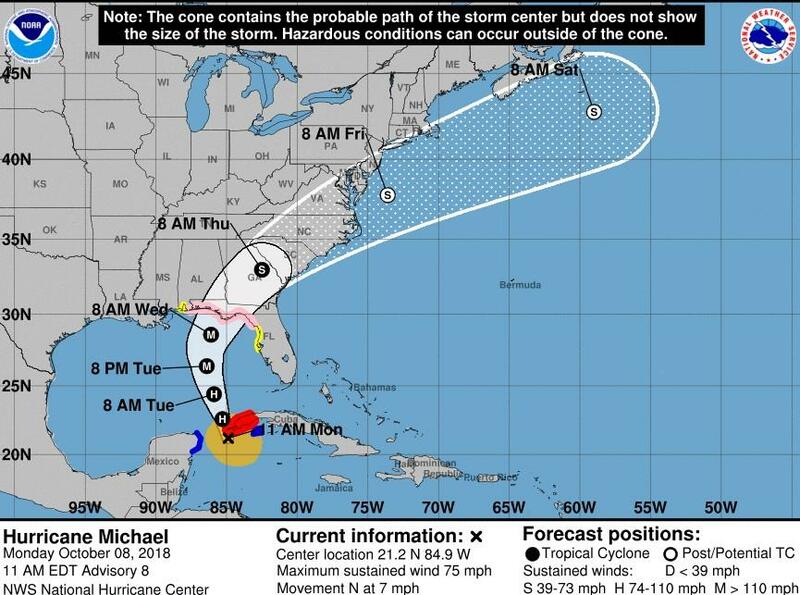 Gadsden County Emergency Management officials urge citizens to prepare now as Hurricane Michael is expected to bring devastating impacts to the gulf coast as a major hurricane as early as Tuesday night. Gadsden County evacuation routes can be found in the Gadsden County Disaster Survival Guide. The guide is available at all Gadsden County libraries and online at www.GadsdenCountyFL.gov. All Gadsden County Public Schools will be closed until Friday, October 12, 2018. The Gadsden County sandbag location at the Post Plant Pit, 1090 Post Plant Rd., Quincy, FL has been extended until further notice. Schools will be closed Tuesday-Thurday. Friday has yet to be determined. Mandatory evacuations for Flood Zones A, B, and C begin at 6am Tuesday, October 9, 2018. To find out what zone you live in, visit this website: http://www.co.bay.fl.us/511/Evacuation-Zones Bay County Sheriff's Office deputies will be patrolling neighborhoods, making announcements about the evacuation. Leon County Schools, Florida State University and its Panama City campus will be closed Tuesday through the end of the week. Tallahassee Community College and Florida A&M University are also closed. The Florida State University Lab School is closed Tuesday. Honeyville Community Center will open at 10 AM, Tuesday as a shelter. Those seeking shelter are asked to bring food, water, blankets and comfort items. Mandatory evacuations ordered for all of Cape San Blas, the Indian Pass area, and WindMark Beach. In the City of Port St. Joe, all areas from St. Joe Bay to Long Avenue are under mandatory evacuation as well. People in mobile homes and low-lying areas have been ordered to evacuate county-wide. Gulf County Schools will be closed through Wednesday, October 17 due to the hurricane and pre-scheduled fall break. Jefferson Somerset K-12 school will be opened as a shelter by county emergency management at noon Tuesday. Schools will be closed Tuesday, with no word yet on when they will re-open. There has been no word yet on evacuations. Update: 10/09/18: Franklin County is issuing a Mandatory Evacuation for all of Franklin County beginning at 8:00 am on Tuesday, October 9, 2018. This is to include all of Franklin County but especially St George Island, Dog Island, Alligator Point, Bald point and anyone living along the coastline and all low-lying areas. This storm has the potential for life-threatening storm surge. Original Story: Schools will close Tuesday through Thursday. Schools closed Tuesday through Friday. Mandatory Evacuation order for Zone A (coastal and low lying areas)and Mobile Homes and other weak structures the... remainder of Wakulla County will be under a voluntary evacuation order. The evacuation orders will start effective at 8 pm this evening (October 8th). Citizens that are evacuating should evacuate to an area outside of the storm’s path. Neighboring counties will also be in the storm’s path and there for at risk. THERE WILL BE NO SHELTERS OPENED IN WAKULLA COUNTY. This is because all of our shelters are rated safe for Category 2 and under hurricanes and Hurricane Michael is forecast to become a Cat 3 by landfall. Please evacuate to Leon County. The location of those shelters will be provided when they are available. Toler in Liberty County and Taylor County Elementary School in Taylor County.